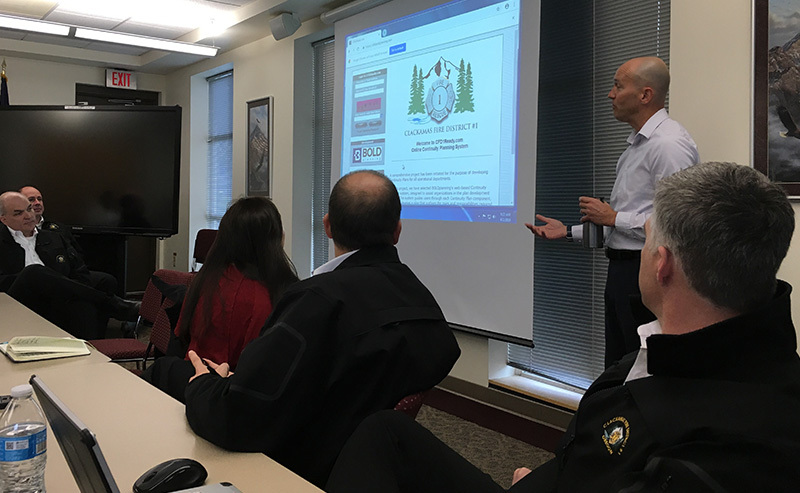 BOLDplanning Kicks Off COOP Initiative with Oregon’s Clackamas Fire District #1 – BOLDplanning Inc.
As one of the largest fire protection districts in Oregon, Clackamas Fire District #1 serves over 220,000 citizens and covers nearly 235 square miles. Each year, its career and volunteer firefighters respond to tens of thousands of incidents from 20 strategically located fire stations. Now, it’s BOLDplanning’s pleasure to proudly serve Clackamas Fire District #1 by supporting its Continuity of Operations (COOP) planning initiatives. To kick things off, BOLDplanning representatives, Brittney Whatley, CBCP, and Matt Eyer, PMP, CHS-V, CBCP, traveled to Oregon just last week (April 1-2, 2019). There, the two met with the District’s many departments individually both days, listening to their planning needs and addressing their questions. Pictured here is Matt providing the District’s executive leadership a high-level view of the BOLDplanning platform, and explaining how it will support its COOP planning efforts. BOLDplanning will return to Clackamas Fire District #1 again in a couple of months when it conducts the first of many, all-important COOP workshops.